In addition to being a popular breakfast food, eggs are a symbol of beginnings. Primitive humans recognized the egg as the beginning of life, and it became a symbol of spring and fertility. Eggs provide an inexpensive source of high-quality protein, vitamins, and minerals, including vitamins A and B12, folic acid, and phosphorus. They are an excellent source of riboflavin. The egg is also said to be a complete protein, because it contains a complete count of essential amino acids. The white supplies more than half the protein in an egg. The yolk supplies the fat, along with the remaining protein, and most of the calories. Eggs are also graded and are classified by both size and quality. The best are grade AA or A, both of which are related to the level of freshness and the quality of the shell at marking. Most recipes are based on large eggs. Nutritionally, there’s no difference between brown eggs and white eggs. Different colored eggs come from different varieties of hens. The most common egg used for food today is the chicken’s egg, although egg from other birds like duck, quail, etc. are used. On opposite sides of the yolk are two, twisted, whitish cord-like objects known as chalazae. A pair of spiral bands that anchor the yolk in the centre of the thick albumen. Chalazae may vary in size and density, but do not affect either cooking performance or nutritional value, unnoticeable when the egg is cooked. It appears as a slight depression on the surface of the yolk, the entry for the fertilization of the egg. It surrounds and holds the yolk, the fresher the egg the stronger the membrane. 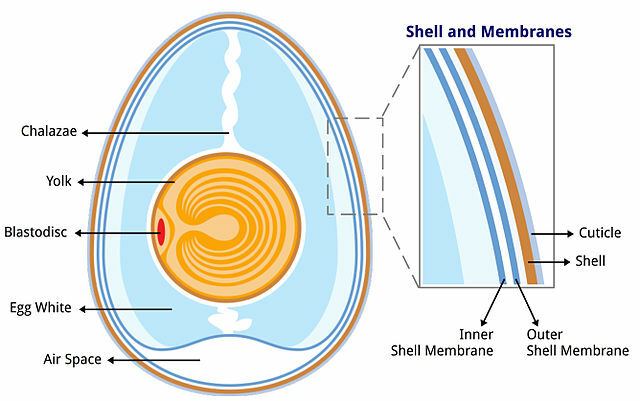 It forms at the wide end of the egg as it cools after being laid, the fresher the egg the smaller the air cell. One of the uses of eggs is as a binder. A binder helps other ingredients bind together (eggs are used to help bind together meatballs, meatloaf and flour mixtures). When eggs are heated they coagulate, this helps stick together the ingredients they are mixed with. Another use of eggs is as a coating agent. The breading on fried chicken sticks because the chicken is dipped into an egg then a flour or crumb mixture. The eggs help hold the crumb mixture to the food when heated during the cooking process. Eggs have thickening properties. The protein in eggs will thicken when heated and become firm. If an egg is overheated or cooked for too long of a time it will become rubbery and tough in texture. Eggs are often used in custards and sauces to thicken the finished product. Eggs are an emulsifier. An emulsifier permits small globules of one liquid to be inter-dispersed in another liquid. For example in mayonnaise the egg acts as an emulsifying agent in keeping the oil and vinegar mixed as one product and not separating out. Eggs are also used as emulsifiers in cakes. When a liquid freezes, ice crystals form. When eggs are added to a mixture, it helps prevent these crystals from forming. That is why another use of eggs is the prevention of crystallization. Using egg as a clarifier is also popular in making of Stock or Broth. The egg is used to make a broth clear. Any unwanted particles in the broth will stick to the egg as it coagulates in the broth. The cooked egg is then removed. One of the most common uses of eggs is as a leavening agent. A leavening agent helps to make a cooked product rise. When eggs are beaten they hold air. When heat is added the structure will coagulate and traps the air. This is what gives angel food cakes, meringues and soufflés their light and fluffy texture. The addition of egg to ice cream and other frozen desserts improves consistency and decreases melting point. To eliminate crystallization and ensure a smooth texture, eggs are included in frozen dairy products. Egg acts as a binding agent for fondant and other soft fillings, improving the softness and texture and adding richness. Confectionery such as chocolate bars and fondant are stabilized by egg proteins. Egg whites act as a clarification agent in the manufacture of wine and some juices, inhibiting enzyme growth and prevent browning of the product. Adding egg to yogurts and pro-biotic drinks gives a desirable creamy texture to the product. Egg gives a smoother texture to pre-prepared microwaveable dishes. Frozen microwaveable dishes which include egg have better freezing and thawing properties. Foods such as mayonnaise, salad dressing, dips and sauces are bound and emulsified by the addition of egg. The whites of AA Shell are thick and firm, yolks is high, round, and practically free from defects, egg itself is clean and unbroken. Grade AA and Grade A eggs are best for frying and poaching, where appearance is important. This eggs have characteristics of Grade AA eggs except the whites are “reasonably” firm. This is the quality most often sold in stores. The eggs have been held a few days in the refrigerator. B shell eggs are clean to slightly stained, air cell over 3/16″ deep, white-weaker and watery. This eggs have whites that may be thinner and yolks that may be wider and flatter than eggs of higher grades. The shells must be unbroken, but may show slight stains. This quality is seldom found in retail stores because they are usually used to make liquid, frozen, and dried egg products, as well as other egg-containing products. Table-ready pasteurized liquid eggs are found in the refrigerated section of the supermarket. The white and yolk of the eggs are mixed, then pasteurized at a temperature high enough to kill any bacteria without cooking the eggs. They can be refrigerated unopened for up to 12 weeks from the pack date. They can be used like eggs already scrambled. Pasteurized eggs in their shells are also now available. Egg substitutes are a blend of egg whites and other ingredients such as food starch, corn oil, skim-milk powder, tofu, artificial coloring, and various additives. Because they are almost all protein, egg substitutes can become rubbery if overcooked. Eggs have the ideal protein mix for growth and repair. It is an excellent source of protein. Very low in fat, a medium egg has less than six grams of fat and is not high in kilojoules. Low in saturated fat, eggs have less than 2 grams saturated fat. Most of the fat is unsaturated. Rich in vitamins, eggs really are nature’s vitamin capsule containing all the vitamins except vitamin C. They are a good source of Vitamin B12 which may be lacking in vegetarian diets. Rich in iron, a serve of 2 eggs contains 2.2 mg of iron (as much as a lamb chop). Iron is best absorbed from food when vitamin C is present so combine your egg with a glass of orange juice for even better nutrition. Its many essential functions include- a building block for cell membranes, required for production of some hormones, essential for production of digestive juices, protection for nerve fibers. The body is able to make this cholesterol in the liver. When selecting eggs, check the container for any cracked or broken eggs and eliminate them from the carton. Place the carton in the refrigerator for up to 5 weeks. Do not place eggs in the designated egg holders in the door of older refrigerators. It is too warm for the eggs there because they get a blast of hot air each time the door is opened. The egg carton helps keep eggs from absorbing odors from other foods and helps keep the eggs fresh. When adding eggs to a mixing bowl, break the egg in a separate dish to make sure the egg is not rotten. Eggs serve many purposes in cooking and preparing food, including a leavening agent in baked goods, a base for mayonnaise, and a thickener in sauces and custards. Served alone, eggs can be poached, boiled (soft or hard), fried, scrambled, or made into an omelet. From a safety stand point, it is recommended that both the yolk and the white be cooked until firm. Because they are made mostly of water and protein, eggs are best cooked over low heat. Proper storage is essential for maintaining quality. Eggs keep for weeks if held at 36°F (2°C) but lose quality quickly if held at room temperature. In fact, they can lose a full grade in one day at warm kitchen temperatures. Store eggs away from foods that might pass on undesirable flavors or odors. If fresh eggs are cracked and then prepared and served immediately, they should be cooked so that all parts of the food are heated to a temperature of 145°F (63°C) or above for 15 seconds. Foods made with raw fresh eggs that are not cracked and then prepared and served immediately should be cooked to heat all parts to 155°F (68°C) or above for 15 seconds. Egg white coagulates, or solidifies, when it reaches temperatures between 144 °F and 149 °F (62.2 °C-65 °C). Egg yolk coagulates at slightly higher temperatures, between 149 °F and 158 °F (65 °C-70 °C). If a boiled egg is overcooked, a greenish ring sometimes appears around egg yolk due to the iron and sulfur compounds in the egg. It can also occur when there is an abundance of iron in the cooking water. Chilling the egg for a few minutes in cold water until it is completely cooled prevents the greenish “ring” from forming on the surface of the yolk. Eggs must not be boiled but simmer for about 20 minutes for a hard cooked egg and cooled immediately in cold running water, fresh eggs should be used and allowed to stand overnight at room temperature before cooking. The cooked egg should be immersed in cold water and flushed in running water immediately after cooking to avoid darkening of the yolk. The greenish coloration of the yolk is due to the formation of iron sulfide during cooking. Iron comes from the yolk and the sulfide from the white. Characteristic of hard boiled egg is tender albumen, well centered yolk, no darkening of yolk, easy to peel. It has a tender but firm albumen, yolk is slightly thickened yet not firm at the edges. A good soft cooked egg may be obtained by simmering for 5 minutes with enough water to cover the egg. Poached eggs are those egg broken out of the shell and dropped into simmering water to coagulate. A drop of vinegar gives a smooth textured product. This is the most popular breakfast preparation and sometimes called eggs coked sunny side up. The eggs are broken out of the shell and pan fried in small amount of oil without breaking the yolk. The upper surface of the yolk is basted with hot oil. Non- stick pan is recommended to use. This resembles fried eggs, except that it starts on top of the stove and finished in the oven individually. This is prepared by whipping the whole egg out of the shell and pan frying just like fried egg. Another way is to whip the white first into stiff foam and add the yolk as whipping is continued. Milk may be added to lower the coagulation temperature and to affect a softer product. Flavor Ingredients- Cheese, vegetables, sea foods, meat. The ingredients are folded gently and bake in a soufflé dish and served immediately from the oven to the dining table.